On this, the 64th anniversary of the atomic bombing of Hiroshima, Japan, we call for an end to militarization in all its guises. An end to bombs, nuclear and conventional. An end to the use of Drones (unmanned aerial vehicles). An end to walls, fences and their virtual counterparts that divide us and promote fear of each other. An end to war without end. This morning we vigil at the gates of Davis-Monthan Air Force Base,home of a Predator UAV unit which now flies missions around the clock in Iraq and Afghanistan armed with Hellfire missiles which have killed hundreds of unarmed civilians. We demand an end to the unilateral slaughter. This afternoon we vigil at a communication tower, “Tucson-1” (virtual fence) construction sight. Fences and walls, solid and virtual, have funneled people in migration deeper into the harsh, dangerous terrain of the Sonoran desert, resulting in more than 5,000 deaths since 1994. These three – bombs, drones and fences/walls – are lethal weapons directed specifically at noncombatants. Cities like Hiroshima, villages in Iraq and Afghanistan and the U.S.-Mexico borderland have been deliberately targeted and violated. These are crimes against humanity. A betrayal of civility. In spiritual terms, a sin. “Today we pray without ceasing for a world without weapons and fences. We pray for peace, for justice, for unity which makes walls and war obsolete. The virtual tower that Heid and Zawada were arrested at is part of a larger initiative by U.S. federal authorities to deter migrants from crossing the border. With physical walls – and in some places double walls – making urban crossings much less likely in places like San Diego, Nogales, and El Paso, the flow of migrants has been channeled into remote places hardly accessible to Border Patrol vehicles. But with the introduction of these virtual towers, equipped with cameras, video, and radar, authorities are pushing migrants into even more lethal terrain. Joseph Nevins reports on the escalation of U.S. border enforcement in his book Operation Gatekeeper: The Rise of the “Illegal Alien” and the Making of the U.S.-Mexico Boundary. After more than ten years since the implementation of the new border strategy, the results have been mostly negative: the federal government has spent billions of dollars in taxpayers’ money; because of border enforcement the smugglers’ industry has boomed to the point of becoming basically indispensable; the violation of human rights of immmigrants continues unabated; there is no real proof that this strategy has substantially reduced “illegal” immigration in the USA; the border build-up, rather than deterring undocumented immigrants from entering the USA, discourages them from returning home; and, most tragically, the number of immigrants dying at the border has simply skyrocketed. To deal with this latter problem the Border Patrol launched in 1998 – five years after the El Paso experiment [Operation Hold the Line] – search-and-rescue operations to help immigrants stranded in the deserts and mountains of the border region. But despite these efforts the number of deaths continues to rise because of the strategy itself – the rerouting of the immigrants towards the most dangerous terrains – that is causing these deaths. The. U.S. government refuses to take any responsibility for all these casualties, which are considered one of the “unintended” consequences of the nation’s effort to protect its sovereignty. The “unintended consequences,” which are more intentional then many Americans are willing to admit, are the reasons why John Heid and Fr. Jerry Zawada sat in prayer at the virtual tower surveillance site. The site they visited is only one of seventeen towers in a 23-mile stretch of the border surrounding Sasabe. 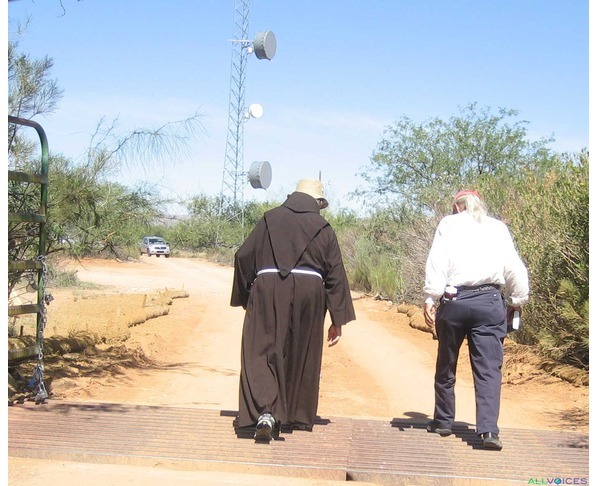 The two men, long-time friends through the Catholic Worker and Plowshares movement, have moved their lives and work to the U.S.-Mexico border south of Tucson. Both are members of the No More Deaths community, whose humanitarian efforts have saved thousands of lives in the harsh terrain of the Sonoran desert.